Chronic heart failure (CHF) is a condition characterised by damaged heart muscles, which subsequently weaken and prevent the heart from pumping properly. There is no cure for CHF however there are management techniques that can assist in improving symptoms. There are several important parameters that measure heart function in people with CHF including aerobic capacity (measured by VO2 max), blood pressure and ventricular structures. One of the main symptoms of CHF is severe exercise intolerance. Nevertheless, exercise has been recommended as an effective additive treatment to medication for some people with CHF. 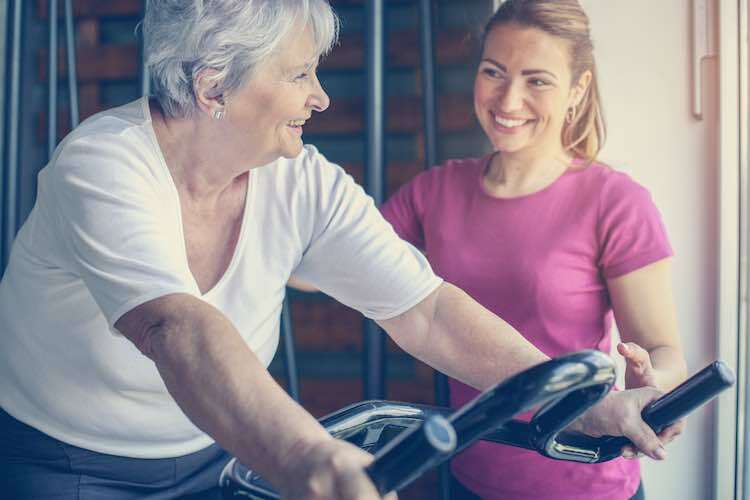 Research has found that short-term aerobic exercise can improve aerobic capacity and Quality of Life (QoL), however it’s not clear whether short-term exercise programs can translate to cardiovascular improvements in people with CHF. Researchers investigated this question, assessing the effect of a short-term exercise intervention on cardiovascular function and QoL in people with CHF. The study was a meta-analysis of existing studies looking at the effect of short-term exercise interventions (8 – 24 weeks in duration) on CHF patients. Participants in the studies ranged from 50 – 75 years old and the research included type, frequency and intensity of the programs. Outcomes measured included VO2 max, systolic blood pressure, cardiac output, heart rate, heart rate variability and QoL. Of the outcomes assessed in the meta-analysis, short-term exercise interventions were found to increase cardiac output and improve QoL in CHF patients. VO2 max was also significantly improved in the interventions involving aerobic exercise as well as aerobic combined with resistance exercise. Exercise cannot replace medication in the treatment of CHF however these results suggest it may be a beneficial addition to treatment regimens to assist in improving aerobic capacity. Aerobic exercise and aerobic combined with resistance exercise were found to be most effective, with resistance exercise on its own not associated with improved outcomes in this area. Exercise may also contribute to improvements in QoL in people with CHF. It’s important that you talk to your doctor before starting an exercise regime to ensure that it is appropriate for your individual circumstances. Zhang, Y et al. (2016). Effect of short-term exercise intervention on cardiovascular functions and quality of life of chronic heart failure patients: A meta-analysis. Journal of Exercise Science & Fitness 14 67 – 75. http://dx.doi.org/10.1016/j.jesf.2016.08.001.